CORN!!! I love corn everything! 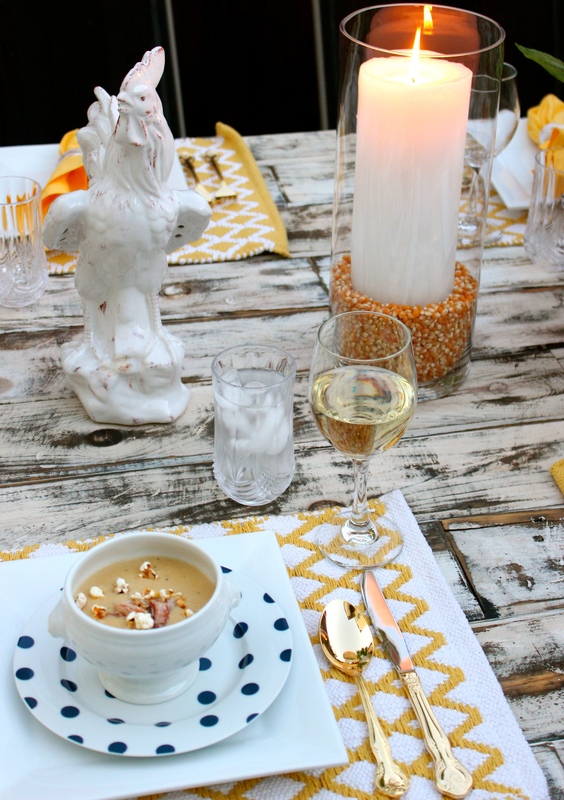 So I created this tablescape to go along with a corn themed menu. 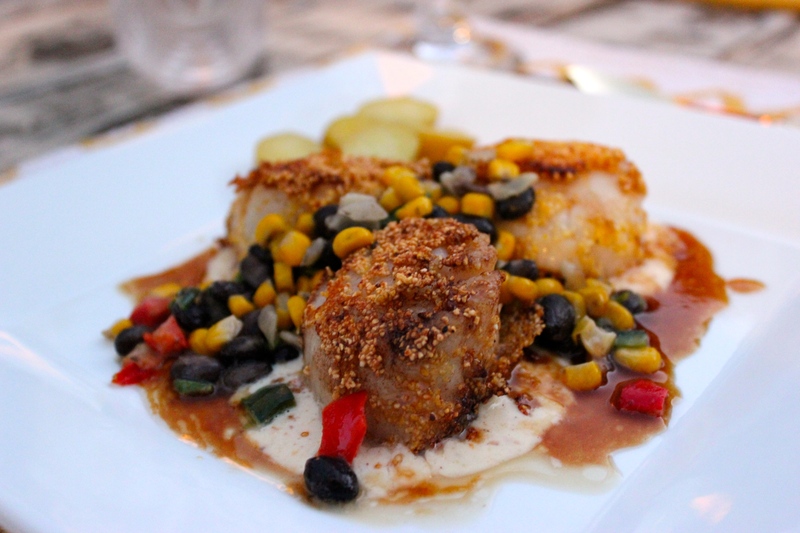 Each dish incorporated corn in some way. Corn is a great starch because it lends itself to savory and sweet flavors. 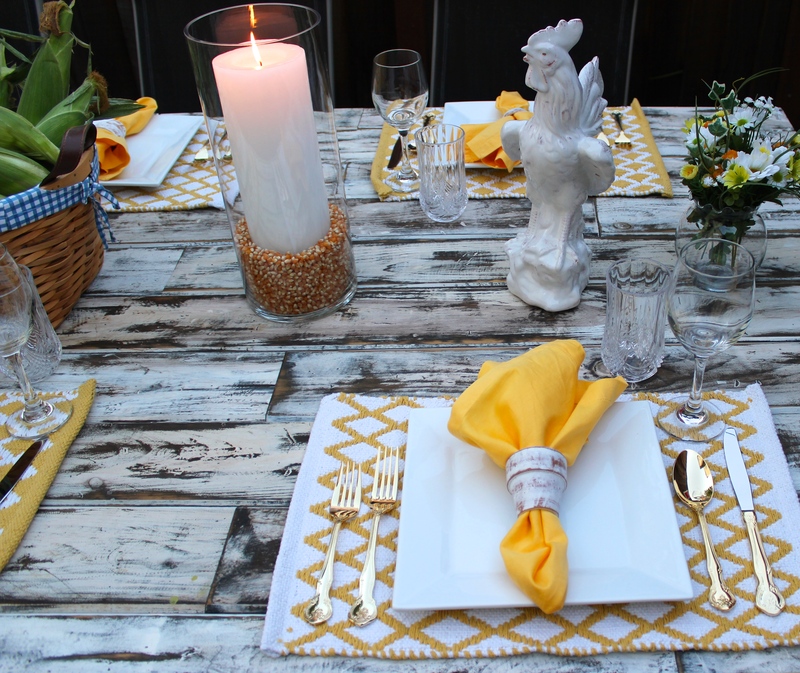 I figured roosters eat corn so I used them as my jumping off point, as well as the color of corn, “yellow.” Blue is another color that works so well with yellow (especially since corn also comes in blue varieties), so I added a few touches with blue polka dot plates. 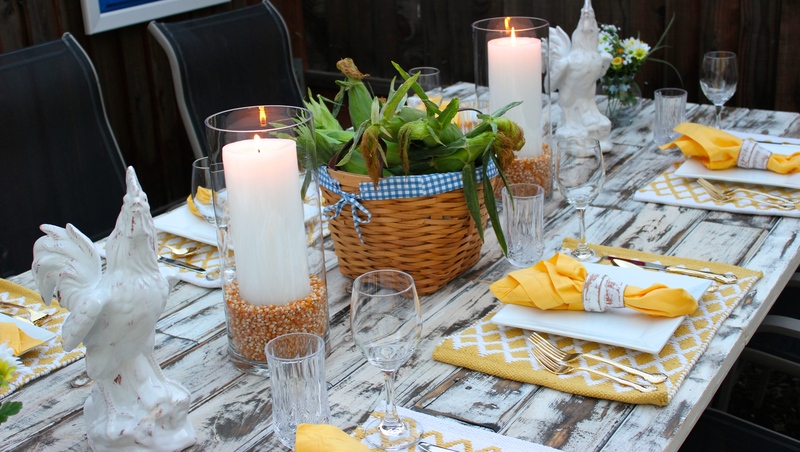 This tablescape and menu can reach into the last crop of corn and ends in September. 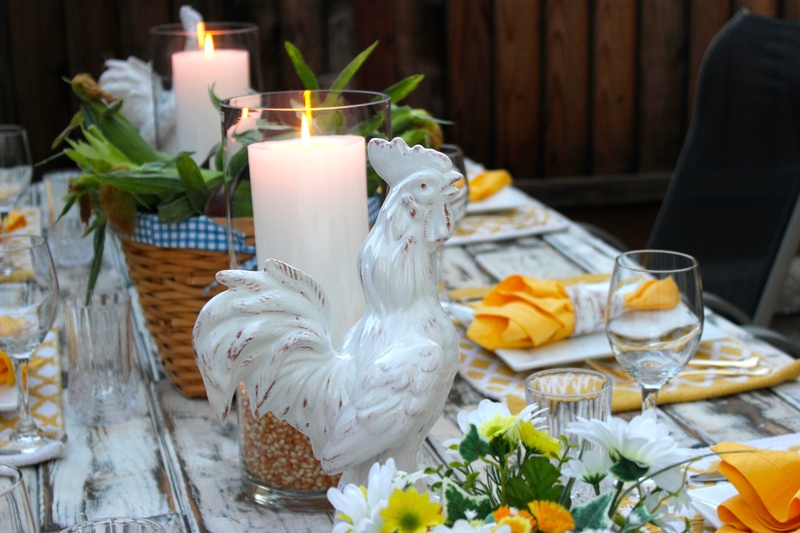 This tablescape took very little time and only a few elements to put together. I used our plank board table top since it gives off a country vibe. It was placed on an outdoor table base. I found reversible placemats at Homegoods. They remind me of miniature versions of weaved cotton rugs my grandfather used to make. Many years ago, I found these adorable clay pot napkin holders at a Joann’s Fabrics, and found some smaller ones more recently on Ebay. I added yellow napkins. My gold flatware re-enforces the yellow of corn. I found these really cool ceramic roosters at Homegoods also, so I flanked them on each side of a basket of fresh corn. As I always do, I try to devise some unique vase filler, so I used unpopped popcorn. One whole bag was enough for two large candle holders. As part of a corn themed menu, I made some tasty corn bisque. Corn and crab/lobster are a perfect combination, so I sautéed some sweet fresh crab and topped the soup with it, and for texture, I added some cayenne spiced popcorn!! The spiciness of the cayenne works to balance out the sweetness of the corn and crab. I crusted fat, juicy scallops with cornmeal, and seared them for a few minutes. I also made a corn succotash with fresh smoked corn, black beans, and bell peppers. I made POPCORN CREAM!! Yes, that’s right, popcorn cream. It’s so easy, and the flavor is so amazing! To a large pot, I added 7 cups of popped corn, with one stick of butter and some heavy cream, salt and pepper. I allowed it to steep over low heat for about 30 minutes. The starch in the popcorn begins to break down and then I blended everything in a Vitamix. I strained out the solids and what’s left is something similar in texture to a really loose potato puree. It has a yummy, buttery, creamy flavor. I could eat this by itself!!! To balance out the sweet flavors, I made a miso caramel by reducing miso, soy sauce and a bit of honey. I drizzled it over the entire plate. Here are 2 menus I offered to clients with all the choices incorporating corn… even down to the desserts.